Quantum Computing and Phytochemistry Research Laboratory 1, Department of Chemistry 2, Department of Physics 3, Bannari Amman Institute of Technology, Sathyamangalam - 638401, Tamil Nadu, India. ABSTRACT: The extensive study on O - methylated flavonoids reveals that substitution with methyl group enhances the radical scavenging behavior in certain compounds. Due to potential applications of C-glycosides in metabolic engineering, methylation in these flavonoids needs to be analyzed in both theoretical and experimental levels for their radical scavenging behavior. In this work naturally occurring C- glycosyl flavonoid apigenin 8-C-glucoside (vitexin) is theoretically simulated by substituting the C4′, C5 and C7 hydroxyl positions with methoxy unit and studied with the aid of density functional theory (DFT) for radical scavenging behavior. Structural stability is attained through B3LYP/6-311G(d,p) theory using Gaussian 03 package which provided the stable conformer for the studied compound without imaginary frequency. Structural activity is analyzed with the support of parameters like kinetic energy (temperature independent), HOMO-LUMO, molecular descriptors, Mulliken charge density analysis and compared with vitexin. Combined investigation of the parameters above revealed the superiority of phenyl hydroxyl vitexin over phenyl methoxy vitexin for radical scavenging activity unlike its O methylated flavonoids. INTRODUCTION: Flavonoids are the secondary metabolites which are well known for their cytoprotective property, anti-inflammatory activity and oxidative stress-reducing action 1. Exploring the antioxidant mechanism of flavonoid compounds through structural activity relationship (SAR) is gaining interest for nearly two decades. Numerous analyses are done for the investigation of SAR, which includes atoms in molecules (AIM), natural bond orbital analysis (NBO), atomic population analysis and molecular descriptors calculation 2. Mainly this analysis gives information about the ability of the flavonoids to scavenge the radicals. The radical scavenging behavior is governed by the charge transfer mechanism which results in hydrogen atom abstraction, protonation and deprotonation 3. 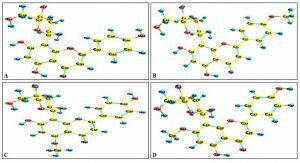 In the present study, an attempt has been made to evaluate the active site for radical scavenging process through the energy profiles of the phenolic rings present in the flavonoid skeleton of methoxyvitexin, and it is compared with vitexin. Kinetic energy analysis yields information about the response of the atoms in the compound by the substitution of a methoxy group at different positions in terms of instability 4. RFW Bader et al., (1969) proposed that the instability of a molecular system results due to the higher kinetic energy of the system. In vitexin, the rings A and C are tightly bound together thereby exhibiting a higher rate of stability which requires more energy for bond dissociation 5. Automatically the B-ring captures more attention because this site needs less bond dissociation energy concerning radical scavenging process and B-ring be the right candidate to prove the instability using kinetic energy analysis. MATERIALS AND METHODS: Neutral structures of vitexin containing hydroxy and substituted methoxy groups in 4', 5 and 7 positions of respective compounds have been optimized at B3LYP level with the basis set 6-311 G (d,p) using Gaussian 03 package (Gaussian Inc., Wallingford). After the successful completion of the optimization process, the obtained results are taken for computing single point energy (SPE) and harmonic vibrational frequency analysis. The frequency analysis result reveals the absence of negative frequencies and then calculations are performed for HOMO and LUMO energy, Mulliken population analysis, molecular descriptors such as ionization potential (IP), electron affinity (EA), hardness (ω), softness (S), electrophilic index (η) and electronegativity (χ) 6. 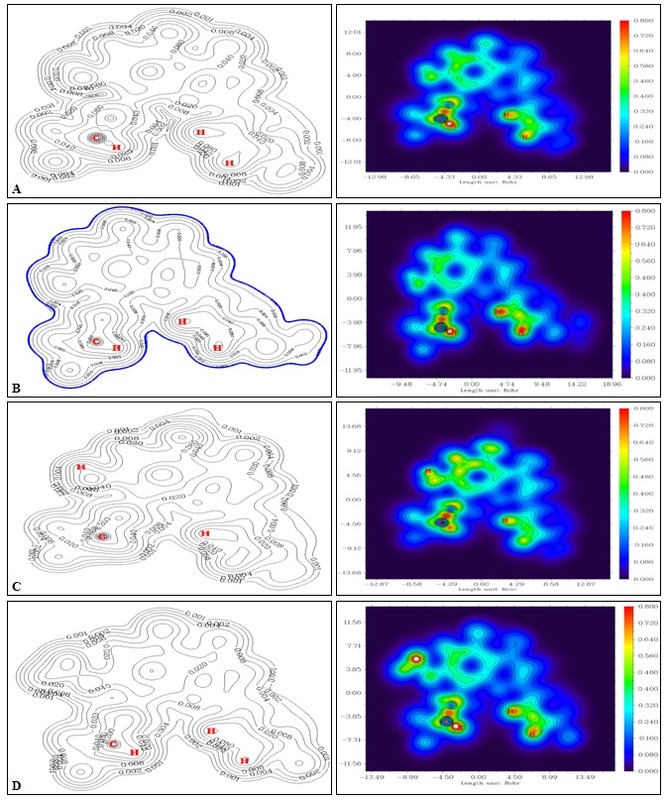 Further, plots based on electron density, kinetic energy contours and Lagrangian kinetic energy G(r) are supported by Multiwfn 3.0 data analyzer have been simulated and interpreted 7. The optimized structures of phenyl hydroxyl vitexin and phenyl methoxy-vitexin4' methoxyvitexin (4' MeOvitexin), 5 methoxyvitexin (5 MeOvitexin), 7 methoxyvitexin (7 MeOvitexin)) along with the numbering schemes are depicted in Fig. 1. Kinetic Energy Distribution: MEP, total charge (electron) density ρ(x) and the Lagrangian kinetic energy density distribution G(r) plots for the flavonoid compounded phenyl hydroxyvitaxin and substituted phenyl methoxyvitexin are shown in Fig. 2 and 3. Generally, charge density distribution, molecular binding, and their mechanisms are explained in terms of classical electrostatics. The techniques which are widely used by quantum chemists to observe the above-said parameters are MEP, HOMO, and LUMO contours, Fukui sites prediction 8. Kinetic energy supports the stability of the molecules by providing information about charge density distribution ρ(r) which serves as a base to examine the stability factor. Kinetic energy distribution can be described with the help of two functions namely Hamiltonian kinetic energy density K(r) and Lagrangian kinetic energy density G(r). K(r) is obtained by integrating the charge density of the system, and G(r) is calculated by normalizing K(r) is also known as positive definite kinetic energy density 9. It is noted from the electron density plot, that vitexin and 5 methoxyvitexin showing analogous charge density distribution, i.e. 4' and 7 positions seem to be electronegative regions and the charge densities are prominent in these regions where C ring is situated along with glucose unit. However, methoxy unit doesn’t show any significant development concerning electronegativity when compared with hydroxyl units, and charge density distribution radiates from A ring to C-ring. Regarding antioxidant activity, the flavonoid compounds with more number of –OH groups favors higher reactivity than the compounds with –OCH3 groups due to the steric effect and increased lipophilicity. But the presence of some hydroxyl units cannot be considered as a deciding factor for antioxidant activity 10. In the present case, for charge density ρ(r) distribution following order has been observed from Fig. 2. 5 MeOvitexin > vitexin > 4' MeOvitexin > 7 MeOvitexin. This is because of A-ring being more stabilized and consists of a double bonded oxygen atom which shows strong electrostatic attraction over the entire methoxy unit. The reduced charge density in 7 MeOvitexin is due to the strong repulsive force exerted by the hydrogen atoms present in the glucose unit to the methoxy unit since the glucose unit as well as the methoxy unit lies very close to each other. It is very interesting to note that G(r) follows the same order as that of ρ(r) and the higher degree of the kinetic energy of 5 MeOvitexin is due to the present high density of charge carriers. At the same instant, the same phenomena have been observed in the case of 4'MeOvitexin due to the steric effect, lipophilicity and the kinetic energy of vitexin are strongly influenced by unstable glucose unit. In the case of 4' methoxyvitexin, B ring shows sharp peaks for kinetic energy distribution. Therefore, it is concluded that the presence of methoxy unit results in an unstable structure of C glucoside and increases charge density distribution on the rings. Instability of a ring may be due to a decrease in units of –OH groups. In this context, the B-ring exhibits higher order of reactivity in the presence of –OH groups than –OCH3 groups. HOMO and LUMO Energy: The electron occupancy values computed from frontier molecular orbitals supports the reactivity of B-ring present in both phenyl hydroxyl vitexin and substituted phenyl methoxyvitexin when compared with A and C rings Table 1. 5 methoxyvitexin experiences strong steric effect rendered by A ring stays very stable and holds very low occupied and highest unoccupied orbitals whereas higher magnitudes of HOMO of 7 methoxyvitexin leading to poor radical scavenging potential. Molecular Descriptors: Molecular descriptors such as IP, EA, χ, η, S and ω are calculated based on the orbital energies and reported in Table 2. It reveals that apart from the superiority of phenyl hydroxyl over phenyl methoxy, methoxy functional group is less supportive for the dissociation process and is taken into account during the radical scavenging process. From Table 2 it is witnessed from χ that the electron-accepting capability is underprivileged for 5methoxyvitexin when compared with remaining three compounds in the order of 5 MeOvitexin < 4' MeOvitexin < 7 MeOvitexin < vitexin. The energy required to remove a loosely bound electron is high for 4' MeOvitexin, whereas EA shows that vitexin doesn’t accept electrons easily concerning the other compounds and hence it is a preferred candidate for antioxidant activity 11. The tendency of 5 MeOvitexin concerning η is weak, and vitexin exhibits the highest electronegativity. Based on the above analysis the following order of activity has been found: vitexin > 4' MeOvitexin > 7 MeOvitexin > 5 MeOvitexin. Mulliken Population Analysis: The investigation of charge delocalization and localization has been carried out by Mulliken population analysis technique and the results are depicted in Table 3. n- π* transition is witnessed in and around B-ring by the accumulation of atomic charges 12. In all the studied compounds possession of a higher number of atomic charges are found at B ring rather than A and C rings and this once again proves that the B ring is a better candidate for radical scavenging activity. Another factor which is observed from Table 3, in addition to B rings of all the compounds, 7 MeO vitexin is also a good candidate for radical scavenging behavior based on the atomic charges. CONCLUSION: Methylated structure of the naturally occurring flavonoid vitexin has been simulated, analyzed and compared theoretically using B3LYP/6-311G(d,p) level of theory with the vitexin. Kinetic energy distributions studies clarify the instability as well as steric effect created by glucose unit and methoxy unit in both compounds using prominent peaks in the particular position where these functional units are located. This is further supported by HOMO-LUMO energies and molecular descriptors which elucidates the higher order of dissociating ability of hydroxyl group than methoxy group. Mulliken charge density analysis depicts the B-ring activity and contribution offered by methoxy unit for radical scavenging activity. 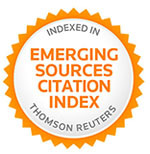 ACKNOWLEDGEMENT: The authors acknowledge the Science and Engineering Research Board, Department of Science and Technology (DST-SERB), Government of India for funding (EMR/2016/002892). Bravo L: Polyphenols: Chemistry, dietary sources, metabolism, and nutritional significance. Nutr Rev 1998. Caltagirone S, Ranelletti, FO, Rinelli A, Maggiano N, Colasante A, Musiani, P, Aiello FB and Piantelli M: Interaction with type II estrogen binding sites and antiproliferative activity of tamoxifen and quercetin in human non-small-cell lung cancer. Am J Respir Cell Mol Biol 1997; 17: 51-59. Nenadis N and Tsimidou MZ: Contribution of DFT computed molecular descriptors in the study of radical scavenging activity trend of natural hydroxybenzaldehydes and corresponding acids. Food Res Int 2012; 48: 538-543. Zhou Z and Parr RG: Activation hardness: new index for describing the orientation of electrophilic aromatic substitution. Journal of the American Chemical Society 1990; 112: 5720- 5724. 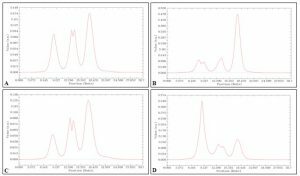 Sadasivam K and Kumaresan R: Antioxidant behavior of mearnsetin and myricetin flavonoid compounds - A DFT study Spectrochimica Acta Part A 2011; 79: 282-293. 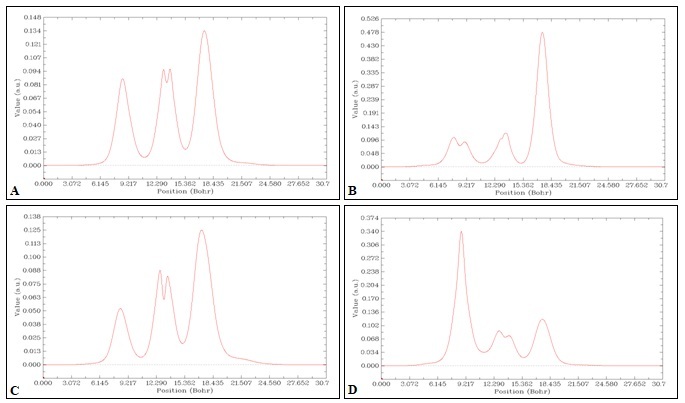 Djeradi H, Rahmouni A and Cheriti A: Antioxidant activity of flavonoids: a QSAR modeling using Fukui indices descriptors. Journal of Molecular Modeling 2014; 20(10): 2476. doi: 10.1007/s00894-014-2476-1. Veitc NC and Grayer RJ: Flavonoids and their glycosides, including anthocyanins. Nat Prod Rep 2008; 25: 555-611. Lu T and Chen F: Multiwfn: A Multifunctional Wave-function Analyzer, J Comp Chem 2012; 33: 580-592. 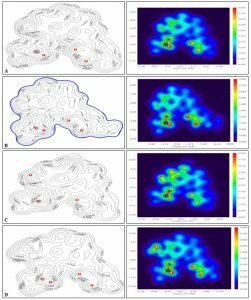 Lu T and Chen F: Quantitative analysis of molecular surface based on improved Marching Tetrahedra algorithm. J Mol Graph Model 2012; 38: 314-323. Jeong JM, Kang SK, Lee IH, Lee JY, Jung H and Choi CH: Antioxidant and chemosensitizing effects of flavonoids with hydroxy and/or methoxy groups and structure-activity relationship. 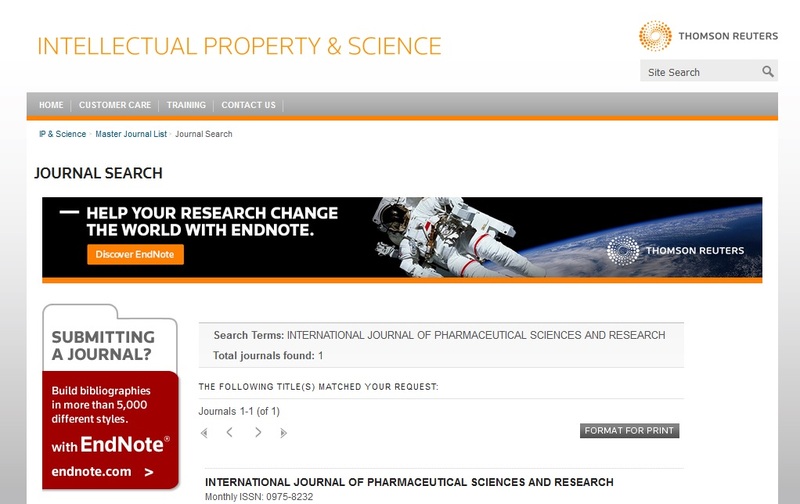 J Pharm PharmaceutSci (www. cspsCanada.org) 2007; 10(4): 537-546. 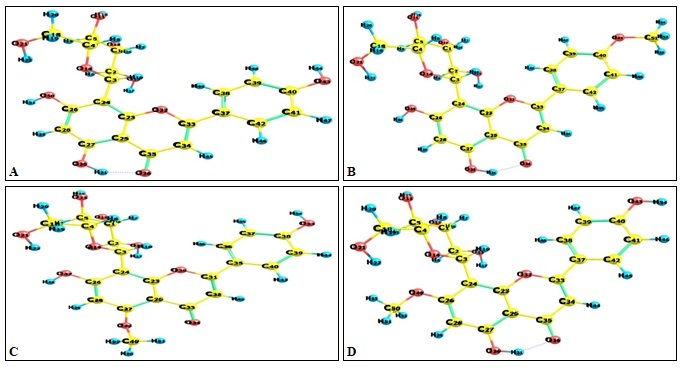 Praveena R, Sadasivam K, Kumaresan R, Deepha V and Sivakumar R: Experimental and DFT studies on the antioxidant activity of a C-glycoside from Rhynchosia-capitata. Spectrochemical Acta A 2013; 103: 442-452. Deepha V, Praveena R and Sadasivam K: DFT studies on antioxidant mechanisms, electronic properties, spectroscopic (FT-IR and UV) and NBO analysis of C-glycosyl flavone, an isoorientin. J Mol Struct 2015; 1082: 131-142. Anbazhakan K, Praveena R and Sadasivam K: Methylation effect of apigenin 8-C-glucoside towards antioxidant potential - a DFT study. Int J Pharm Sci & Res 2019; 10(4): 1734-40. doi: 10.13040/IJPSR.0975-8232.10(4).1734-40. Authors Address: Department of Chemistry, Bannari Amman Institute of Technology, Sathyamangalam, Tamil Nadu, India.